Description: Bauer Huge Floral Basket Pin - As seen at the Chicago VFCJ mini, this limited edition piece is available in other color combinations - amethyst rhinestones with antiqued brass, red rhinestones with antiqued brass - this was my choice for spring - a wonderful azure blue basket with clear and rose flowers and peridot rhinestone leaves, set in antiqued silver. 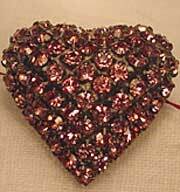 Measures approximately 4 inches high by 2.25" wide and 1.5 inches DEEP. Marked with edition number. 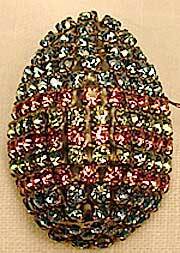 Absolutely breathtaking, and an "ultimate" piece for basket or floral pin collectors. Description: Bauer Nantucket Flower Basket - What a beautiful piece! 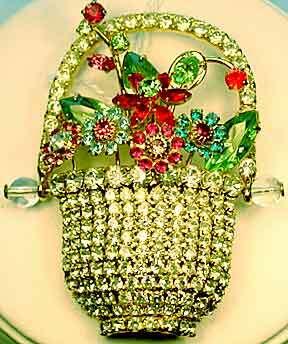 Three dimension basket with moveable handle, all done in clear rhinestones in goldtone; flowers are in teal, fuchsia, hyacinth, purple and sapphire blue glass rhinestones, accented with peridot green glass and rose pink rhinestones. 2 1/2" x 2" at the widest points, and over 1/2" deep. Wonderful for the basket collector or anyone who loves flowers. 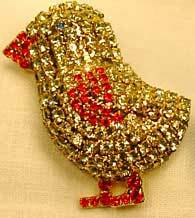 Description: Bauer Chick Pin - Here, chick, chick, chick! What a perfect gift to put in that special someone's Easter basket. Done in jonquil rhinestones with hyacinth beak, wing and feet and a single blue stone for an eye, this harbinger of spring will hop right into someone's heart. About 1 3/4" x 1" x 1/2" deep. 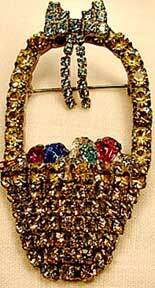 Description: Bauer Easterbasket Pin - Our basket of "eggs" is done in jonquil yellow rhinestones and set in antiqued silvertone, accented with a blue bow. 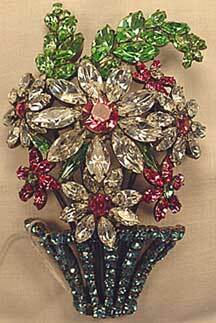 Multi-colored teardrop rhinestones fill the basket ("the eggs") and are accented with small lime green rounds. 2 1/4" x 1 1/4" with curved 3-D basket.